There is a tendency among people active in social movements (like the antiwar movement) to look at ourselves and think that this is it, that we are the whole of the movement, that we know all the players. When we think we know all the players, as well as how to talk to them/ourselves, then we can become lax on communicating with a broader public. This limits efforts to recruit, activate, or make alliances with, additional players. If we think about the antiwar movement only in terms of its kinetic energy (i.e. that which is already in motion) we will look around at the actors currently on the stage and think that it is up to us alone to end the war and prevent future wars of aggression. This would require magic. We can- not realize our vision of peace and justice with only our current numbers mobilized. We must build a far larger movement. We have to activate potential energy. The third primary role of an antiwar core that we will discuss in this final essay is to build the movement’s capacity by facilitating the participation of large numbers of people. Change agents must provide more opportunities for everyday people to take meaningful action to end the war. We must set others up to play helpful ongoing roles that they can sustain. We have to accommodate multiple levels of participation. And we must activate existing social networks and institutions to work to end the war, rather than only building the movement one recruit at a time. This facilitative role–perhaps more than either of the previously discussed roles–requires an antiwar core to conceptualize itself as such and to understand the nature of its relationship to a broader movement. Antiwar core essentially refers to committed antiwar change agents; those individuals who, through whatever combination of circumstance, experience, effort and choice, find antiwar organizing among their primary commitments. Having a critical number of these folks will be indispensable to a successful antiwar movement. 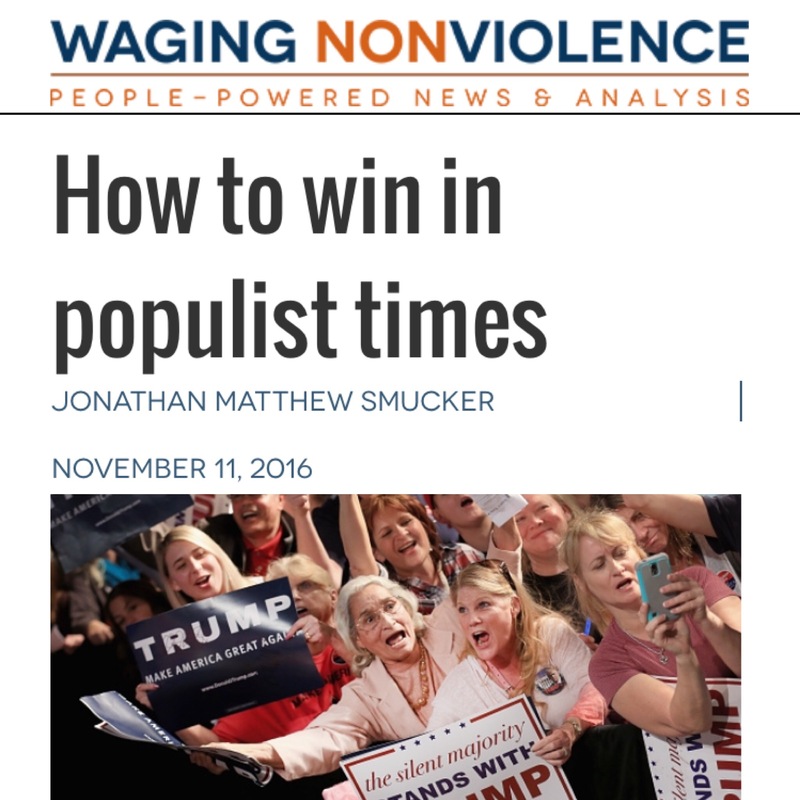 However, a serious impediment to building a bigger movement is the tendency among such uniquely positioned individuals to act as if we alone might somehow end the war. Sure, we can have some impact. But if we are talking about posing a potent challenge to entrenched power structures, then we have to look far past ourselves. To succeed, the antiwar movement needs to effectively tap hundreds of thousands-if not millions-of people who are willing to give something. Many such folks are already out there, but organizers need to attract them and give them some direction. If the antiwar core can’t effectively activate the next tier of potential movement participants, it will certainly fail to engage the broader society. These potential participants are not even the base, but rather the start of the base needed to change the direction of US policy. Therefore, the interplay between these tiers of movement participants is of critical importance. If the kinds of progressive changes we imagine are ever to be realized, it will be through the active participation of large numbers of teachers, nurses, factory workers, barbers, artists, service workers, students, religious communities, civic organizations, unions, allies within the existing power establishment, and, especially, soldiers, veterans and their families. These participants will come as they are, and as such we must welcome them. They will give what they are willing to give, and we must affirm the smallest contributions. The antiwar movement cannot afford to have a high bar for entry. If we are to build a popular movement, we must accommodate a continuum of levels of involvement, as well as levels of political analysis. There will be problems, challenges and struggles. But there will also be learning, growth and development. The antiwar movement needs a development plan, a growth trajectory. Growth means getting more people involved in antiwar efforts. So how do we do that? What motivates people to become active in such work? What makes an activist or change agent? I had always explained my own activism in terms of my beliefs.1Somehow I had developed a set of beliefs, and then those beliefs demanded action. However, I began to question this assessment as I discovered that many people held similar beliefs that did not translate into activism. In other words, while many people hold beliefs compatible with the antiwar movement’s goals, a small percentage are taking action; and a primary factor for why some people do become active is simply that they encounter opportunities provided by people close to them who are already active. Proximity to movement activity can activate people’s dormant beliefs. If we want a growth trajectory, then a primary role of antiwar organizers is to provide opportunities that turn others’ favorable dispositions into activism. For this reason it is essential that antiwar change agents be embedded in common social networks and institutions within their communities. If change agents perpetually cluster in their own separate spaces, if they surround themselves only with each other, how many opportunities can they provide for others to get involved? If activism occurs more from proximity to opportunities to become active than from individual dispositions, then shouldn’t change agents try to get close enough to people to be able to effectively provide them with such opportunities? The initial lead-up to the Iraq War provided circumstances that encouraged a lot of people to act on their dispositions to try to stop the war before it started. There was a feeling that perhaps public opinion against an invasion was strong enough to deter the Bush Administration. People who were generally hesitant or disinclined to participate in street protests did so anyway, hoping that a large showing might make a difference. And they certainly did turn out in big numbers. The antiwar demonstrations around the globe on February 15, 2003 marked the largest coordinated protest in world history. In January of the same year a small group of folks in Lancaster, Pennsylvania advertised for a public meeting to plan local action to stop the impending war. To their surprise this meeting drew more than 200 people, all upset about the prospect of war, but glad to be there together. I was beyond pleased to see so many people come together in this politically conservative area. We decided we should keep meeting. It was clear to me that, while a meeting of 200 people was valuable, we would have to structure the next meeting differently if we were to harness the energy and skills of those in attendance. I volunteered to co-facilitate a follow-up meeting in which we formed working groups to focus on specific tasks and projects. I had prior experience with the working group model, and it seemed a good fit for getting so many people active quickly. The meetings and working groups continued and became the Lancaster Coalition for Peace & Justice (LCPJ), which is still working to end the war today. So, while it is often challenging to get people to take the first step of getting involved, sometimes circumstances-like the lead-up to the Iraq War-encourage larger numbers of people to take this step all at once. In such circumstances a little bit of effort can go a long way in providing opportunities to new participants, as was the experience of folks in Lancaster. In these situations organizers have to struggle just to keep up. Plugging in new volunteers and getting them to stick around is generally far more challenging than initially attracting them. In Lancaster we suddenly found ourselves with an abundance of new volunteers. The first wave of leadership in the LCPJ was mostly comprised of such persons who, like most people, already had important responsibilities in their lives. A few individuals in particular had taken on some overwhelming responsibilities. As the LCPJ took on a longer-term existence, many of these people were unable to sustain the level of sacrifice the LCPJ seemed to demand of them. For the most part these folks, while still supportive of the LCPJ, dropped off as active participants. Conversely, those who took on more manageable (but still meaningful) ongoing tasks are mostly still active, attending to the same roles or tasks that they originally committed to (e.g. our treasurer, archivist and designers). At first when people would ask me how to get involved with the LCPJ, I would encourage them to come to a monthly meeting. One day it suddenly struck me as ludicrous that our primary recruitment strategy was “come to a meeting.” I had noticed for some time the low retention rate of folks who took this initial step. Groups inevitably develop some level of internal culture that can be alienating or intimidating to newcomers (though less so when the group makes a conscious effort to be accessible and inviting). So I started taking time to sit down one-on-one with individuals who expressed interest in the LCPJ. I started taking an hour or two with such persons, first inviting them to tell me about themselves-their interests, experiences, talents, etc.-and then I would tell them about some of the LCPJ’s projects. Together we would try to find a good fit for them. I would also identify pieces the coalition was lacking that I thought they might be interested in working on. I encouraged volunteers to find or invent an ongoing role or task that they could sustain. For every new role someone would fill, we increased our collective capacity. We could accomplish more, thereby increasing our visibility, thereby attracting more participation. And telling this story of the parts working together as a whole to build and exercise grassroots power gave meaning to even mundane tasks by putting them in the context of a collective trajectory. Stories like this can give people a sense of meaning, purpose and personal agency. These are all important if we want new participants to stay involved. But there is something else that is even more important. If we want to inspire people to stick with the antiwar movement for the long haul, then we absolutely must make them feel valued and appreciated. It’s basic. People like to be around people who are nice to them. If we want to compete with the myriad of often more appealing options for people’s free time, then we have to treat each other well. We have to be very, very good to each other, to take care of each other, to rise above the social elitism that infects our society. This work is about love. Yes, the world is in crisis, and the work is often draining, but if we are to appeal to broader participation, we have got to step out of crisis mode organizing and take the time to love-not only humanity in the abstract, but each other specifically-along the way. Here again, the concept of an antiwar core is helpful; those change agents who recognize themselves as part of a core have to take additional responsibility for the group culture, to make sure that people feel appreciated. When local antiwar groups like the LCPJ organize events, the temptation is to expend what limited resources we have on outreaching to constituencies that are more likely to attend, which usually means outreaching to other progressive groups and constituencies. By default, and to some degree necessity, outreach efforts focus on harvesting already existing consciousness rather than planting new seeds. Let’s say a group has a budget to make 300 leaflets for an antiwar event, and has five volunteers to distribute the leaflets, it makes good sense, with a short-term goal of getting good turnout to the particular event, to devote such limited outreach resources to posting flyers at places where likeminded people are likely to see them. However, the short-term goal of using limited resources to get good turnout is in tension with the long-term goal of growing a movement by reaching (and providing opportunities for) new people. Moreover, if an antiwar group is focusing predominantly on attracting other progressives to attend an event, this is likely to shape the language used to promote it. A flyer written to attract people who are already solidly “with you” may look substantially different than one written to attract a broader audience. Similarly, the character of an event may be drastically different if it is assumed that everyone present is already in agreement. This is a huge contributing factor in explaining why many social movement groups become insular and isolated; we grow too accustomed to talking to each other – preaching to the choir. The language we use references commonly held meanings within our progressive groups and networks, and is often alienating or even unintelligible to people who do not share those meanings. The problem is not just about where we place flyers and whom we have in mind when we write them. The outreach limitations groups have are real, and it may not always be feasible to flyer a broader constituency. But flyers don’t usually make the best “seeds” anyway. Seed work requires reaching people where they are, within the spaces and with the references they are accustomed to. For example, getting an event listed in a church bulletin (by finding an ally in the congregation) will likely prove more effective than posting a flyer on the wall. But we need to move beyond promoting our events too. We need to bring the event to cultural spaces that already exist – classrooms, religious centers, neighborhood groups, etc. I can easily spend twenty hours planning and promoting an antiwar event at which I’ll be happy if a few unfamiliar faces turn out – and such events can have their place and value. But I can also spend just two hours preparing to talk to a classroom of high school students, presenting a more in-depth antiwar critique than many of them will have ever previously encountered. This is critical seed planting work. It requires finding and maintaining allies within existing cultural spaces and institutions (in this case the teacher who invites me to speak). Often our events-meetings, forums, cultural events or demonstrations-are geared toward us, the change agents, and what we feel comfortable with, rather than toward the people we need to engage, with consideration for what they may be able to relate to. Coming together with likeminded people can feed and sustain us, but we can’t afford to lose interest in attracting broader participation. And we must not neglect to engage already existing cultural spaces. Sometimes we become disinterested in or even hostile toward such spaces because they house the values of the dominant culture. But these spaces also house the people. We cannot expect people to meet us where we want them to be. We have to meet them where they are, with the language they use, in the spaces they frequent. Entering existing networks and institutions allows the people within them to consider taking action to end the war without feeling that they would have to lose their identity to do so. They can take action as teachers, or union members, or students, or members of a religious community. They do not have to become an “activist”-a distinct identity that many people are uncomfortable claiming-in order to take action. Instead they can begin to imagine working to end the war as an expression of who they already are, alongside people they already know. This is one of the biggest lessons from US social movements in the 1960s and 1970s: movements usually grow (in size and capacity) quickly not by building their own separate infrastructure from scratch, but by organizing within existing social networks and institutions until they identify strongly enough with the movement that their already existing infrastructure and resources go to work for movement ends. The Civil Rights Movement spread like wildfire and dramatically increased its capacity when black churches and traditionally black schools came to identify themselves as part of a movement. People didn’t have to leave their social networks to become part of the movement. Rather, membership in these institutions came to imply movement participation. These institutions and networks then used their resources-most significantly people power-to further movement goals. Building our own separate infrastructure from scratch is resource-intensive. And resources for such infrastructure are harder to come by because of the small pool of invested persons. This is not at all to say that specific movement organizations like (in the Civil Rights Movement) the Student Nonviolent Coordinating Committee (SNCC) and the Southern Christian Leadership Council (SCLC) are not important. Movement organizations can be critically important, often playing irreplaceable roles. However, social movement organizations cannot bring about sweeping changes alone. Organizers and movement organizations are valuable mostly in their role of organizing and mobilizing social sectors, which is to say facilitating broad participation. Our organizations are invariably to some extent a reflection of our values, but we have to keep this in check. We must not seek such a pure reflection of our values that we become disinterested in effectiveness and lose sight of our purpose of ending the war. When groups and organizations become overly concerned about their purity, they cut themselves off from the people they should be working to organize. If such groups seek to grow at all, their recruitment efforts will be impaired by the fact that they are building a righteous-but alienating-identity more than a viable vehicle for change. Change agents must not focus exclusively on building their own alternative infrastructure to feed an alternative narrative that distinguishes them from others. Those who maintain this tendency confine themselves to living a story of the righteous few, in which they lack inevitably the ability to affect the changes that they long for. The necessary numbers will elude them and the necessary resources will remain in the hands of others. If, on the other hand, we succeed in connecting with others, then there is no other. The walls between others and us start to come down. Resources become available and doors open, not magically, but through effective organizing that is made possible through relationship. Returning to Lancaster County, another peace and justice organization was founded in April of 2004 called the Lancaster Interchurch Peace Witness (LIPW). From the start the LIPW has worked collaboratively with the LCPJ, while playing a particular role that the LCPJ is not as equipped for. As a group of local leaders and members of Christian churches, the LIPW is able to work for peace and justice by engaging their own church memberships in ways that no organizer or organization would be able to do were they outside of the Christian faith. The LIPW can serve as an important model for the broader antiwar movement, not because of their particular faith, but because they are a group of conscientious people active in similar social networks and institutions who get together to talk about how to promote peace and justice within those networks and institutions, and how to move them to work for peace and justice in the broader society. Fundamentally they are insiders, genuine and sincere. While some people in their churches may disagree with them, they cannot easily dismiss them. The antiwar movement does need to build its own organizations, but they have to be organizations that focus outwardly, beyond “the choir.” Some of these organizations may cast a wide net , as does the LCPJ, while others, like the LIPW, may go deeper into specific networks. As they say, different strokes for different folks.4 But all of our organizations-local and national-must learn to see past themselves in order to do their part to grow the antiwar movement. We have argued in this essay that a primary role of antiwar change agents is to activate and facilitate popular participation in efforts to end the war. We have argued that to achieve the strength required to realize the changes we envision, an antiwar core must activate the next tier of potential movement participants by providing them opportunities to take action, by plugging them into long-term roles, and by nurturing them along the way. Finally, we have argued that in addition to building our own organizations, antiwar change agents must engage existing cultural spaces, social networks and institutions to move whole layers of society into action. First person voice for this essay is Jonathan Matthew Smucker. Or we could say different strokes to reach different folks. It should be noted that as separate vehicles the LIPW and the LCPJ are better positioned to fulfill specific complimentary missions. It should also be noted that the organizations have been able to collaborate very closely, largely because they both value alliance and relationship and are outwardly focused; as such they refrain from the kinds of alienating rhetoric and behavior that often prevent such collaboration. Click here to download a PDF version of the complete Building a Successful Antiwar Movement pamphlet.